This rugged peninsula, some 200 miles long and 100 miles wide, has been called “Alaska in miniature”—every Alaska wildlife habitat type except Arctic tundra is represented here. It also boasts an extensive network of roads, waterways, and hiking trails that offer ample opportunity to observe wildlife in its natural surroundings. Northeast Kenai follows the Seward Highway from the upper reaches of Turnagain Arm and across the Chugach Mountains to join the Sterling Highway as it hugs the Kenai River. Float the Kenai River or hike a chain of beautiful lakes to experience the essence of Kenai wildlife viewing. Northwest Kenai picks up the Sterling Highway as it crosses a vast network of rivers, lakes and wetlands on its way to the coast. The Kenai River flats, five miles upstream from the sea, draw birds, seals, moose and caribou within viewing distance of a busy highway. Southeast Kenai leads you down the Seward Highway to the town of Seward, once a fur trading post along the shores of Resurrection Bay. 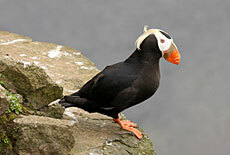 From here you can venture into the Gulf of Alaska and a wilderness coast of glaciers, islets, cliffs and fjords. 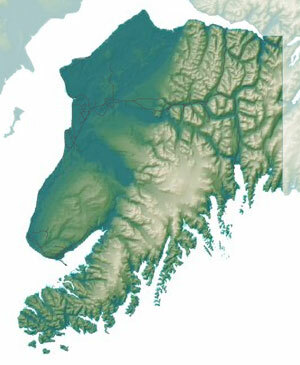 Southwest Kenai follows the Sterling Highway from Anchor Point to Homer and across Kachemak Bay to Seldovia. On your way into Homer, stop and take a photo at the Baycrest Hill Viewpoint where you just might catch whales, sea otters, eagles, fishing boats and active volcanoes in a single shot. The information on this website comes from the Kenai Peninsula Wildlife Viewing Trail Guide, created by the Alaska Department of Fish and Game in partnership with local volunteers, businesses and non-governmental organizations and public land management agencies.